Anne Lamont headlines a Get Lit! event at the Bing on April 28. 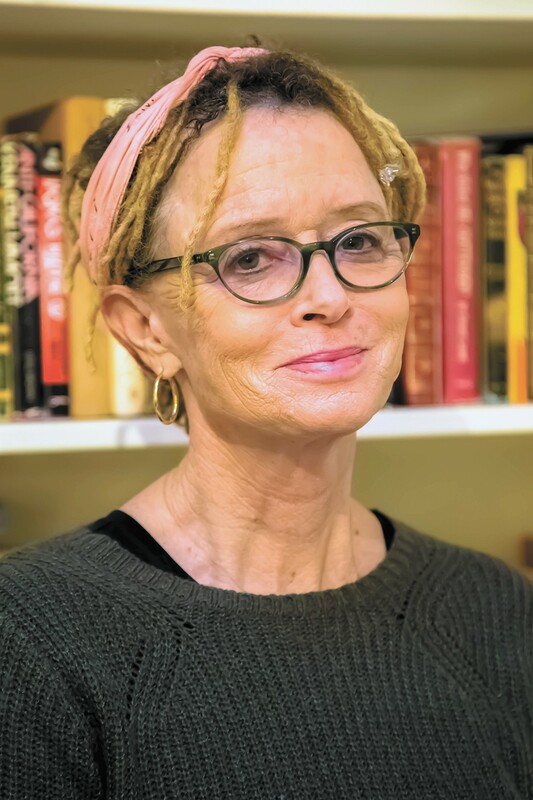 Anne Lamott has spent her professional life establishing an utterly unique writing voice, one capable of juggling complex issues from alcoholism to new motherhood to renewed religious faith in a series of exceedingly popular novels, nonfiction books and essays. Virtually all of her writing is infused with remarkable humor she mines in unexpected places, and her skill at addressing issues most of us often would rather not think about has earned her critical praise, commercial success and a devoted fanbase. We traded emails with Lamott ahead of her visit to Spokane to headline an event for Get Lit! and talked about what's off-limits in her writing, her upcoming book and keeping the faith in dark times. INLANDER: Your last book, Hallelujah Anyway: Rediscovering Mercy [released April 2017], offered many readers hope in a confusing, difficult time for our country. How do you keep the faith? LAMOTT: I pay attention to all that is beautiful and amazing and heroic marbled into our lives, and I try to help others with the dark and scary stuff. Being of service always lifts my heart and spirits. You've written everything from novels to essays to personal memoirs. Do you have a favorite? I love essays, about 1,500 words, based on real experience but with a spiritual or philosophical angle. I used to tell my students to write what they'd love to come upon, so I try to write pieces that are illuminating and, I hope, funny. Can you describe a little of your writing process, and perhaps how it's changed over the course of your life. Do you listen to music as you write? Do you keep regular "writing hours"? Can you write on the road when you're talking to groups? I've always written really terrible first drafts, whether for a novel, of 300 pages, or an essay, of six. I kind of clean up and cut a little as I go along, but I really let myself over-write and babble on. That's how I find out what I am trying to say, or who the characters are. I'm afraid there is no lean, clean technique that works for me. I sit down quite early, give myself short assignments ... and reward myself when I've finished a tough paragraph or passage — MSNBC and some M&M's. No music or noise. Your discipline in writing is remarkable — where do you think that drive and devotion to your talent comes from? My dad was a writer, and showed me that a writer sits down at the same time every day. That waiting for "inspiration" is BS, and doomed. You just do it. If I get some work done in the morning, I know I'll have a different feeling all day, of having lived up to something. What's a perfect day for Anne Lamott look like? Whether a writing day, a traveling/speaking day or day "off," if you have such things? I love not writing, and spend a lot of time just reading. If I've written something decent or a bad first draft that might actually turn into something, that's a good day. I hike for an hour most days (I have a large dog) and, in general, spend as much time as possible in nature. You tackle highly personal subjects with humor and grace — are there still areas of your personal life or beliefs that you're fearful or reticent to address in words meant for public consumption? Not fearful, but am very protective of my family's and my own privacy. By the time I put something out there to the public, I am almost positive it is universal. I share my deeply personal life with my partner, my son, a few friends. Are there any regrets about any of your writing? As in, do you reflect much on past works and think about aspects you'd write differently now? Well, as for any writer, when you go back and read something already published, you can't believe all the lazy or mealy-mouthed or show-off parts. I think, "Where were my editors????" What role does social media play in your life? It's obviously become an undeniable part of so many of our existences — do you find it useful? Frustrating? Fun? Love it. Live for Twitter — I follow incredibly brilliant political and spiritual thinkers, and really like the links to articles and interviews and think pieces they've produced. Plus the humor is extraordinary — it helps me stay buoyant on bad days. What is your life as a reader like? Are you as voracious as you were growing up? Do you love any particular genres, or avoid any? And where do you hear about new books or authors? Yes, I have always read like I do now — endlessly and everything. I read a lot of nonfiction, biographies. Also, psychological thrillers. More books by women, and lots of poetry. People thrust books at me, or I read about them in The New York Times Book Review (or People). Anything you can share about your new book coming this fall, Almost Everything, in terms of themes you're addressing? The original print version of this article was headlined "Writing, Hiking and M&Ms"